5 year old: Mummy songs never really end. No mummy, they never end because we carry them in our hearts. Wow, yes that is absolutely true, I really believe that. How did you come to know that, did you talk or read about that with one of the teachers at Kinder? 5yo: No. My brain is like an iPad inside me and I just reached inside and pressed the love button. As we rounded the bend, the house adorning the top of the vivid green rolling hills dominated the view. I gasped and held my breath. I have always had such a visceral reaction to abandoned and decaying homes, it’s like simply seeing them tears the fabric of time somehow and I feel the lifetimes of the house through me. That probably sounds like crazy talk, but I really feel the force of joy, sorrow and every other emotion felt in the broken rooms that once housed who knows? Why? Is all I could manage to get out whilst still holding my breath and pointing at the enormous house. ‘Ah yes. That’s the house that never got to be’ was the response from my enigmatic new friend and tour guide. ‘How so?’ I asked as he pulled over and we got out to stare up the hill at the grey skeleton of the house. ‘A young couple went to huge amounts of trouble to have that entire house trucked in pieces from another part of the island, but the relationship fell apart in the time it took to restore the house- they never actually moved in. The husband bought out the wife’s share of the house but he never lived in it at all, he moved right out of the area.’ He explained delighting in the storytelling, the astonished look on my face, or both. ‘But he didn’t sell it? Who owns it now?, How long has it been here to have fallen in to such disrepair?’ The questions scattered out of me and my heart was aching at the feeling of anger and loss jutting out of every splintered weatherboard. ‘I believe it’s still owned by his family, but they live down South, I don’t know that anyone’s ever even come up this way to see it.’ He replied. I couldn’t ask any more questions. Here was such an enormous house that should have been teeming with stories, sounds, thoughts and images of what was and what still is. I should have been reeling with decades of a home, yet here I stood at the roadside overwhelmed by the loneliness and emptiness, a sadness for everything that could have been but was never given the chance. I wondered, had the couple ever stood here, decades after they first walked away and felt the same? I breathed out slowly, we returned to the car and drove away. And so we sat there together on the bench while I slowly regained the ability to see straight, but feeling a bit stupid for making a public mess of myself I tried to thank him and get up so as not to further monopolise his time and embarrass myself (which was of course another stupid decision as I started the involuntary spinning all over again. So I accepted that I just needed to stay put with this kind man. ‘Please take your time, that sudden spinning is not fun is it? I’ve got a brain tumour and so that happens to me from time to time.’ I suddenly felt really selfish taking this care from someone who clearly needed their own ‘I am really sorry you are having to go through that’ I stammer. ‘Oh gosh no, no this is not about me’ he replied with such warmth ‘Tell me about you’ he continued. ‘You mean when I’m not dramatically passing out on the street?’ I asked as we both laughed. I told him that I’d just moved to the area from the city with my young family and that I was a musician who produced events for a day job and his already serene face lit up. ‘I used to run music venues and festivals before my first stroke’ he said, ‘and a music shop- two record shops!’. The joy on his face was more an elixir to me than the water, I was feeling so much better. We talked like co-conspiritors about the music scene past and present for a few more minutes and I could have talked for so much longer, but his wife had come out of the library and stood waiting certainly not impatiently, but with an air of needing to take control of proceedings and this man whose name I didn’t know carefully stood up. ‘This is my wife- she steers the boat now my brain can’t quite be trusted.’ ‘Hello’ I said, ‘I’m sorry I’ve commandeered your wonderful husband’s time, but he just saved my life I think.’ She smiled with a tiredness and sadness that made me think that his illness had progressed further than his wonderful animated conversation betrayed. The man squeezed my hand ‘Are you sure you’re ok? Please keep the water.’ He said. ‘Yes, I’m so much better thanks to you., I’m so grateful you were here’ He walked about 4 steps towards his car and I watched him with equal measures heart-full and sadness and then he turned around. He looked me straight in the eyes and smiled fully, I can only describe it as paternal, like a dad might look at his daughter at a university graduation, I felt deeply and completely seen, it took me by complete surprise. ‘Look at you’ he said ‘you have such a spark- you are going to set this town alight.’ And then he got into the passenger seat and I waved as his wife drove him away. I sat awestruck for quite few minutes before slowly getting to my feet too. The illness that had been well and truly threatening to consume me seemed to have significantly shifted, I felt strength in my body that had been absent for weeks. 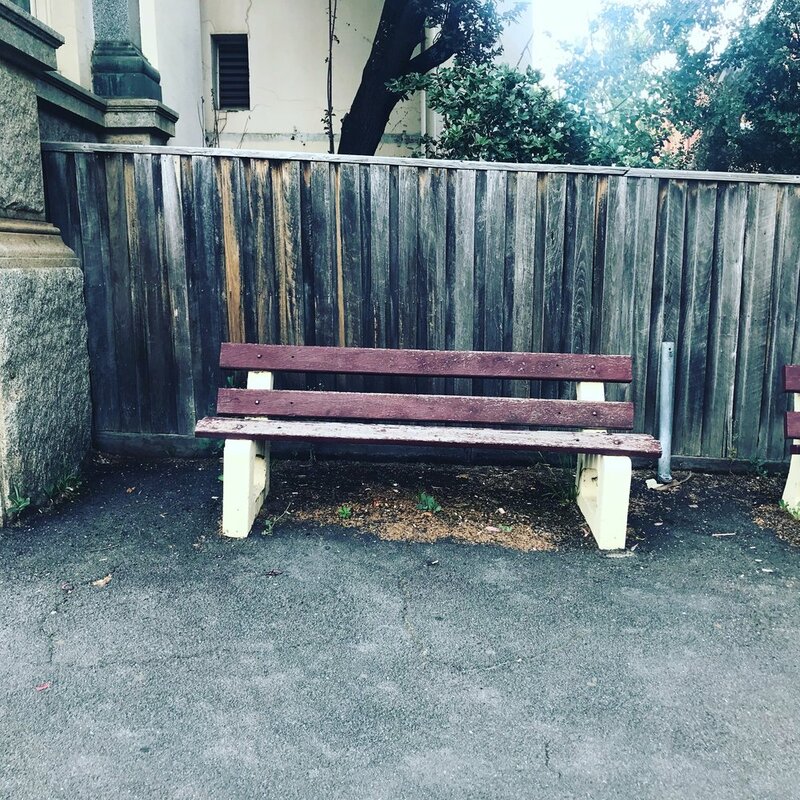 It could have been the medication that had been pumped into my veins starting to work, but when I walk past that bench in town, I’m still convinced that it was something so much more and I will forever be grateful for that brief, magical meeting.